Cooperation between an activated oncogene like RASV12 and mutations in cell polarity genes like scribbled, result in tumor growth in Drosophila where tumor cells also display invasive behaviors. Here a simple protocol for the induction and observation of the benign and invasive tumors is presented. Srivastava, A. A Protocol for Genetic Induction and Visualization of Benign and Invasive Tumors in Cephalic Complexes of Drosophila melanogaster. J. Vis. Exp. (79), e50624, doi:10.3791/50624 (2013). Drosophila has illuminated our understanding of the genetic basis of normal development and disease for the past several decades and today it continues to contribute immensely to our understanding of complex diseases 1-7. Progression of tumors from a benign to a metastatic state is a complex event 8 and has been modeled in Drosophila to help us better understand the genetic basis of this disease 9. Here I present a simple protocol to genetically induce, observe and then analyze the progression of tumors in Drosophila larvae. The tumor induction technique is based on the MARCM system 10 and exploits the cooperation between an activated oncogene, RasV12 and loss of cell polarity genes (scribbled, discs large and lethal giant larvae) to generate invasive tumors 9. I demonstrate how these tumors can be visualized in the intact larvae and then how these can be dissected out for further analysis. The simplified protocol presented here should make it possible for this technique to be utilized by investigators interested in understanding the role of a gene in tumor invasion. Progression of tumors from a benign to a metastatic state is a step wise process that is characterized by evasion of protective mechanisms present in the body 8. For example tumor cells in the body must be able to evade apoptosis and the immune system, breakthrough the specialized extracellular matrix (ECM) called Basement Membrane, and overcome any social controls imposed by the surrounding cells 8. It is through a step wise progression that the cancer cells acquire the ability to migrate and colonize distant sites in a process called metastasis. Our understanding of how the tumor cell overcomes the barriers imposed by the body is still in its infancy, however, the emerging picture from research done thus far points to a repeated use of normal developmental processes and signaling pathways by the cancer cells 11-13. The fruit fly Drosophila melanogaster has contributed tremendously to our understanding of normal development and disease through use of sophisticated genetic techniques developed over the past several decades 14-17. Using mutagenesis and overexpression tools we have arrived at a better understanding of various oncogenes and tumor suppressor genes 18-22. However, tumor metastasis is a result of cooperation between several genetic lesions that has been studied primarily in cell culture models 23,24 as well as various xenograft models 25-27. These models though powerful have their limitations as they do not mimic entirely the conditions found in a living organism. Furthermore, transgenic models available in mice are cumbersome and not conducive to genetic analysis of invasive behavior 28,29. Several studies have attempted to understand invasion of tumor cells in Drosophila 30,31. These techniques primarily utilize transplantation of primary tumors to hosts and then rely on tracking the transplanted tumors for invasion of neighboring tissues 32,33. A powerful technique called MARCM 10 was adapted by Pagliarini and Xu to model tumor invasion in Drosophila 9. This elegant genetic modeling of tumor invasion exploited the cooperation between an activated oncogene and the loss of cell polarity. The power of this modeling lies in the fact that the invasive tumors are created in an intact organism thus circumventing the need for transplantation of tissues. To bring about the oncogenic cooperation, an activated oncogene like RasV12 is expressed in clones of cells in the larval eye-antennal disc. As a result of the MARCM technique these clones are also marked with green fluorescent protein (GFP) for easy visualization and are made homozygous for cell polarity mutants like lethal giant larvae, scribbled, and discs large. The result is GFP tagged invasive tumors in the cephalic complex. In this report I demonstrate how to induce, and visualize these invasive tumors both in the context of an intact larvae and in dissected out cephalic complex. The tumor induction presented here utilizes reagents on the second chromosome of Drosophila. In Table 2, I provide a listing of stocks on X and 3rd chromosomes that can be utilized for the same purpose. I believe that this simplified protocol will make this technique readily accessible to researchers interested in understanding the molecular basis of tumor progression. Use stocks listed in Table 2 for the induction of benign tumors. Collect ten female virgins from the "tester" stock and ten males from the "tested" stock. Cross the males and females from the "tester" and the "tested" stock by placing them both in a vial with fly food. Place the cross in a 25 °C incubator and allow the males and females to mate and lay eggs for 24-48 hr. Check the vials for sufficient egg deposition and for the presence of first instar larvae making sure that the culture is not drying out. Add a few drops of autoclaved distilled water to the culture to keep it moist (if the culture is drying out). Continue to monitor the culture and repeat step 1.7.1 as needed. Observe wandering third instar larvae under a fluorescence stereomicroscope as outlined in section 3. Use stocks listed in Table 2 for the induction of invasive tumors. Continue to monitor the culture for dryness and repeat step 2.7.1 as needed. Observe third instar larvae under a fluorescence stereomicroscope as outlined in section 3. Use third instar larvae for benign tumor isolation and visualization. Wet a paint brush in distilled water, and using this paint brush scrape a few third instar larvae from the wall of the culture vial. Place larvae in a depression slide with 1X PBS and then using a wet paint brush scrape off any food material from the larval epidermis. Place the larvae in a Petri plate and leave at -20 °C freezer for 30 min to immobilize the larva. Alternative method to immobilize larvae using FLYNAP. Place a FLYNAP wand dipped in FLYNAP to the vial from 3.1.3.2 and after plugging the vial let plugged vial with larvae stand for 30 to 40 min. Place the immobilized larva on a glass slide, add a drop of light halocarbon oil, cover with a cover glass and observe under a fluorescence stereomicroscope with the capability to visualize Green Fluorescent Protein (GFP). The benign tumor bearing larvae will fluoresce green in the anterior region where the cephalic complex is present. Select day 10 larvae (after induction) from the culture set in step #2 above for observation of invasive tumors. Day 10 larvae are selected because invasive tumor bearing larvae have an extended larval stage and generally fail to pupariate. Follow steps 3.1.1 to 3.1.4 except instead of third instar larvae use day 10 larvae. The day 10 invasive tumor bearing larvae will fluoresce green in the anterior region where the cephalic complex is present. If the fluorescent microscope is equipped with a digital camera then take pictures of the fluorescing benign and invasive tumor bearing larvae. The translucent epidermis of the larva makes it difficult to observe the extent of invasion of tumors. Thus the extent of invasion is better visualized by dissecting the cephalic complex out of the larva. The following steps should be utilized to dissect the cephalic complex. Using a wet paint brush select third instar larvae (for benign tumors) and day 10 larvae (for invasive tumors) from the respective culture vials. Place larvae in a well of a dissection dish containing cold 1X PBS. Use paint brush to scrape off any food particles from the larval epidermis. Transfer clean larvae to a fresh well of the dissection dish containing cold 1X PBS. Check for presence of GFP fluorescence using a stereomicroscope capable of detecting fluorescence. Discard non-GFP bearing larvae. Add 1.0ml of cold 1X PBS to a fresh well on the dissection dish and using a pair of forceps transfer a larva bearing either the benign or invasive tumors (the dissection protocol remains the same for these two types of tumors). Hold the larva down using a pair of forceps about 2/3rds from the anterior end. Use the other pair of forceps and smartly separate the posterior 1/3rd of the larva and discard it. Let go of the anterior 2/3rds of the larva. As the pressure inside the larva is released the contents of the larva will ooze out of the body cavity. Use a pair of forceps to remove the gut, fat body and other inner contents of the larva that have oozed out of the body cavity. Use a pair of forceps to hold the mouth hook of the larva and push it into the larval epidermis and using the other pair of forceps invert the larva completely. Use the forceps to gently and carefully remove the fat body, salivary glands, gut, the wing disc complex and any tracheal tubes. The cephalic complex should now be visible attached to the mouth hook of the inverted larva. The brain hemispheres and the ventral nerve cord (VNC) would still be connected to the larval epidermis through the nerves emanating from the VNC. Use a pair of forceps to gently break the connections between the cephalic nerves and the larval epidermis. As the nerve connections between the VNC and the larval epidermis are broken and excess fat body and other tissue removed, the cephalic complex would become clearly visible and will be attached to the larval epidermis only at the mouth hooks. The cephalic complex can be left attached to the larval epidermis if the complex needs to be fixed for downstream applications like antibody staining or for later visualization. If no further downstream applications would be performed then the cephalic complex can be detached from the larval epidermis and placed in a drop of a glycerol based mounting media for further observation and analysis. Use VECTASHIELD as the mounting media. As a result of the protocol presented here the user will be able to induce benign tumors by overexpressing an activated oncogene in the larval eye antennal imaginal disc. The user will also be able to induce invasive tumors in the eye antennal disc by overexpressing an activated oncogene in clones of cells also mutant for a cell polarity gene. The tumors could be easily visualized with the help of a fluorescent stereomicroscope as "green fluorescent" tissue in the whole larvae or in cephalic complexes that have been dissected out of the larval body cavity (Figure 1). The benign tumors will be localized to the eye antennal disc complex as clones of GFP positive cells whereas the invasive tumors will result in massive overgrowth of tumors and subsequent migration of GFP positive invasive tumors to the VNC and other contiguous organs. In >10 day old larvae (derived from the invasive tumor genotype) GFP positive and detached secondary tumors floating in the larval body cavity may also be observed. Furthermore, while the larvae bearing the benign tumors pupariate on time, the ones bearing the invasive tumors have an extended larval period and fail to pupariate. These invasive tumor bearing larvae could be easily observed as "giant larvae" with a fluid filled body cavity. Figure 1. Benign and Invasive tumors in Drosophila. A-B left panel: Green fluorescing larva with benign and invasive tumors, respectively. A-B right panel: Dissected cephalic complexes from larvae bearing either benign or invasive tumors respectively. A) Benign tumors are localized to the eye-antennal disc where they are induced. Notice that the GFP labeled tissue has not migrated to contiguous organs like the ventral nerve cord (VNC). Compare this to B. B) Cephalic complex bearing invasive tumors from a day 10 larva. Notice the overgrowth of tumor tissue (green) and also invasion of contiguous organs like the VNC and mouth hooks by the tumor tissue (indicated by a red arrow). The invasion of the contiguous organs by the invasive tumor tissue is indicated with an arrow. Click here to view larger figure. Figure 2. A classification scheme for invasive tumors based on the extent of migration over the VNC. The schematic of the VNC is shown with the extent of tumor migration depicted with green color fill. The number associated with the severity of migration is given above each schematic. Table 2. The genotype of stocks needed to induce the benign and invasive tumors. All stocks have been described in the reference indicated. Stocks should be requested from the laboratory of Tian Xu. Cancer is a complex disease with a much better understanding today than in the past. However, much still needs to be learnt and explained before we have a complete picture of the underlying mechanisms. The simple protocol presented here makes it possible to genetically induce benign and invasive tumors in a whole organism and then study the biology associated with the progression of tumors in this model. Most of the existing techniques in Drosophila and other organisms either utilize a cell culture based system to understand tumorigenesis & metastasis or a system that employs transplantation of primary tumor tissues into adult hosts 23-27. Both the cell based and transplantation techniques have their limitations. For example, the transplantation technique is cumbersome and time consuming and could result in transplantation of non-tumor tissues into the host. This could result in production of experimental artifacts. Furthermore, cell culture based systems are only approximations of the real environment that exists in a whole organism. This limitation makes it hard to mimic the very important tumor and the micro-environment interaction that plays a critical role in tumor progression and metastasis 34. The technique presented here has been successfully employed by several research groups to investigate the genetic and molecular basis of tumor progression in Drosophila. For example, utilizing this technique it was demonstrated that the JNK pathway is both upregulated in invasive tumors and is also necessary for the progression of tumors 35,36. In another study the role of Matrix MetalloProtease in tumor progression was demonstrated in this genetic model 12,37. The critical steps associated with the protocol presented here begin with the correct genotype of stocks used for induction of benign and invasive tumors. Care should be taken to ensure that these stocks are not "breaking down". The stocks can be periodically checked for the presence of yellow (y-) flies which would be indicative of a stock breakdown. This would indicate that the FLP-Out cassette in the MARCM tester stock has spontaneously flipped out and would thus be expressing Gal4 constitutively. This can be prevented by keeping duplicate stocks in vials and at 18 ° C. Also, as the tumors are induced, the day on which the larvae should be checked for benign and invasive tumors is also critical. While benign tumor bearing larvae follow a developmental timeline that is closely similar to wild type larvae, the story with larvae bearing invasive tumors is different. The invasive tumor bearing larvae display extended larval stage and some fail to pupariate. Indeed this property of pupariation versus failed pupariation has been utilized as a measure of invasive tumor suppression by Menut et al. 38 Because of the extended larval stage in invasive tumor bearing larvae it is critical to observe invasive tumors around day 8-10 post induction for best results. At day 8-10 enough tumor migration has happened on the VNC so that it is easily observable under a stereo microscope. Beyond day 10, while the tumor can be observed, it begins to completely engulf the VNC making it difficult to orient the cephalic complex in dissected specimens. Another critical step associated with visualization of tumors in whole larvae is the ability to immobilize the larvae. Both FlyNap and reduced temperatures can be used to immobilize the larvae as outlined in the detailed protocol. Finally, if the dissected cephalic complexes need to be stained with an antibody then the dissections should be carried out on ice and complexes should be fixed within thirty minutes. The technique presented here can be utilized by researchers to understand the contribution of genes suspected to play a role in tumor progression. Using this genetic model a gene's up regulation can be studied in-situ by antibody staining techniques or through the use of RT-PCR. One can also attempt to understand whether a gene is necessary for tumor progression by utilizing this model in combination with mutants for the gene in question or RNAi reagents. For example, an RNAi reagent for a gene to be tested for tumor suppression could be present on the 3rd chromosome. In this case the tester and tested stock combination for chromosome 2 could be used (Table 2) only after the RNAi bearing 3rd chromosome has been crossed into the tested stock. Once this has been achieved then the tester and tested stock for chromosome 2 can be crossed and suppression of invasive tumors assayed. A suppression of invasive tumor phenotype would suggest a gene's involvement in the invasive process. However, the suppression of the invasive phenotype may not be completely penetrant and it is for this reason that I present a classification scheme for invasive tumors based on the extent of migration of the tumors over the VNC (Figure 2). Utilizing this classification scheme one can easily compare invasive tumors to invasive tumors where a gene suspected to be involved in invasion has been knocked down. Analysis of several cephalic complexes may give a better insight into the extent of invasive behavior suppression. While the protocol presented here can be used in combination with knockdown of one or two genes to study the genes' effect on tumor progression, simultaneous knockdowns of more than two genes would be technically difficult to achieve. Finally, a modification of this technique was utilized by Wu et al. 39 to understand the effects of juxtaposing activated oncogene expressing cells against cells that were mutant for cell polarity genes. The technique by Wu et al. was a modification at the level of genetic reagents however the experiment utilized dissection of cephalic complexes for visualization of tumors. Thus the method to dissect cephalic complexes presented here could be useful for scientists trying to utilize the modified technique presented by Wu et al. as well. Research in my laboratory is supported by the WKU Department of Biology startup funds, WKU Research Foundation RCAP-I grant # 11-8032 and by a KBRIN-AREA grant funded through a parent grant from the National Institute of General Medical Sciences of the National Institutes of Health under award number 5P20GM103436-13. I would also like to acknowledge Dr. Tian Xu in whose laboratory I was introduced to this technique and Dr. Raymond Pagliarini who first established this technique in the Xu laboratory. Table 1. Materials needed to perform the experimental protocol presented in this article. Bale, A. E. Hedgehog signaling and human disease. Annu Rev Genomics Hum Genet. 3, 47-65 (2002). Coombs, G. S., Covey, T. M., Virshup, D. M. Wnt signaling in development, disease and translational medicine. Curr Drug Targets. 9, 513-531 (2008). Gistelinck, M., Lambert, J. C., Callaerts, P., Dermaut, B., Dourlen, P. Drosophila models of tauopathies: what have we learned. Int J Alzheimers Dis. 2012, 970980 (2012). Marsh, J. L., Thompson, L. M. Drosophila in the study of neurodegenerative disease. Neuron. 52, 169-178 (2006). Reiter, L. T., Bier, E. Using Drosophila melanogaster to uncover human disease gene function and potential drug target proteins. Expert Opin Ther Targets. 6, 387-399 (2002). Valenta, T., Hausmann, G., Basler, K. The many faces and functions of beta-catenin. EMBO J. 31, 2714-2736 (2012). Pagliarini, R. A., Xu, T. A genetic screen in Drosophila for metastatic behavior. Science. 302, 1227-1231 (2003). Wu, J. S., Luo, L. A protocol for mosaic analysis with a repressible cell marker (MARCM) in Drosophila. Nat Protoc. 1, 2583-2589 (2006). Boccaccio, C., Comoglio, P. M. Invasive growth: a MET-driven genetic programme for cancer and stem cells. Nat Rev Cancer. 6, 637-645 (2006). Srivastava, A., Pastor-Pareja, J. C., Igaki, T., Pagliarini, R., Xu, T. Basement membrane remodeling is essential for Drosophila disc eversion and tumor invasion. Proc Natl Acad Sci U S A. 104, 2721-2726 (2007). Wang, W., Eddy, R., Condeelis, J. The cofilin pathway in breast cancer invasion and metastasis. Nat Rev Cancer. 7, 429-440 (2007). Brand, A. GFP as a cell and developmental marker in the Drosophila nervous system. Methods Cell Biol. 58, 165-181 (1999). Brand, A. H., Dormand, E. L. The GAL4 system as a tool for unravelling the mysteries of the Drosophila nervous system. Curr Opin Neurobiol. 5, 572-578 (1995). Vidal, M., Cagan, R. L. Drosophila models for cancer research. Curr Opin Genet Dev. 16, 10-16 (2006). Parks, A. L., et al. Systematic generation of high-resolution deletion coverage of the Drosophila melanogaster genome. Nat Genet. 36, 288-292 (2004). Blair, S. S. Genetic mosaic techniques for studying Drosophila development. Development. 130, 5065-5072 (2003). Xu, T., Wang, W., Zhang, S., Stewart, R. A., Yu, W. Identifying tumor suppressors in genetic mosaics: the Drosophila lats gene encodes a putative protein kinase. Development. 121, 1053-1063 (1995). Rebay, I., et al. A genetic screen for novel components of the Ras/Mitogen-activated protein kinase signaling pathway that interact with the yan gene of Drosophila identifies split ends, a new RNA recognition motif-containing protein. Genetics. 154, 695-712 (2000). Therrien, M., Morrison, D. K., Wong, A. M., Rubin, G. M. A genetic screen for modifiers of a kinase suppressor of Ras-dependent rough eye phenotype in Drosophila. Genetics. 156, 1231-1242 (2000). Albini, A., et al. A rapid in vitro assay for quantitating the invasive potential of tumor cells. Cancer Res. 47, 3239-3245 (1987). Zicha, D., Dunn, G. A., Brown, A. F. A new direct-viewing chemotaxis chamber. J Cell Sci. 99, (Pt 4), 769-775 (1991). Fidler, I. J. New developments in in vivo models of neoplasia. Cancer Metastasis Rev. 10, 191-192 (1991). Mueller, B. M., Romerdahl, C. A., Trent, J. M., Reisfeld, R. A. Suppression of spontaneous melanoma metastasis in scid mice with an antibody to the epidermal growth factor receptor. Cancer Res. 51, 2193-2198 (1991). Konantz, M., et al. 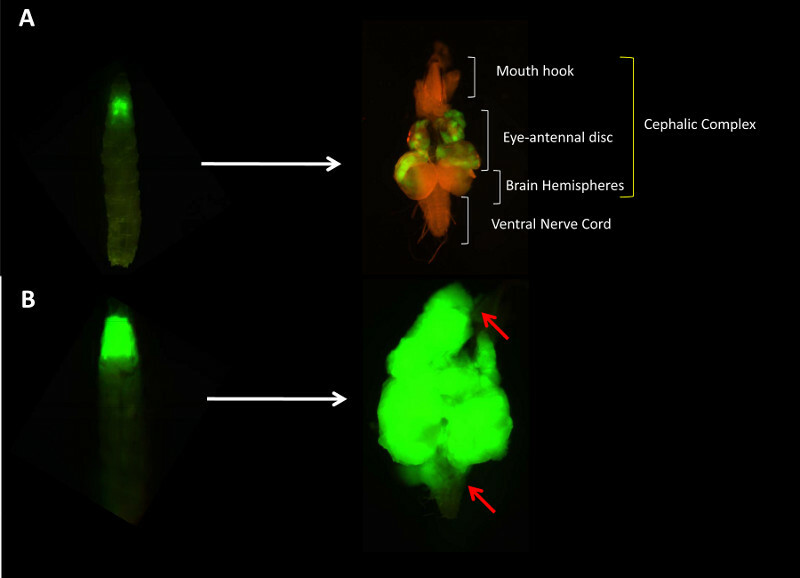 Zebrafish xenografts as a tool for in vivo studies on human cancer. Ann N Y Acad Sci. 1266, 124-137 (2012). McIntyre, R. E., vander Weyden, L., Adams, D. J. Cancer gene discovery in the mouse. Curr Opin Genet Dev. 22, 14-20 (2012). Mattison, J., vander Weyden, L., Hubbard, T., Adams, D. J. Cancer gene discovery in mouse and man. Biochim Biophys Acta. 1796, 140-161 (2009). Miles, W. O., Dyson, N. J., Walker, J. A. Modeling tumor invasion and metastasis in Drosophila. Dis Model Mech. 4, 753-761 (2011). Stefanatos, R. K., Vidal, M. Tumor invasion and metastasis in Drosophila: a bold past, a bright future. J Genet Genomics. 38, 431-438 (2011). Beaucher, M., et al. Drosophila brain tumor metastases express both neuronal and glial cell type markers. Dev Biol. 301, 287-297 (2007). Beaucher, M., Hersperger, E., Page-McCaw, A., Shearn, A. Metastatic ability of Drosophila tumors depends on MMP activity. Dev Biol. 303, 625-634 (2007). Joyce, J. A., Pollard, J. W. Microenvironmental regulation of metastasis. Nat Rev Cancer. 9, 239-252 (2009). Igaki, T., Pagliarini, R. A., Xu, T. Loss of cell polarity drives tumor growth and invasion through JNK activation in Drosophila. Curr Biol. 16, 1139-1146 (2006). Uhlirova, M., Jasper, H., Bohmann, D. Non-cell-autonomous induction of tissue overgrowth by JNK/Ras cooperation in a Drosophila tumor model. Proc Natl Acad Sci U S A. 102, 13123-13128 (2005). Uhlirova, M., Bohmann, D. JNK- and Fos-regulated Mmp1 expression cooperates with Ras to induce invasive tumors in Drosophila. EMBO J. 25, 5294-5304 (2006). Menut, L., et al. A mosaic genetic screen for Drosophila neoplastic tumor suppressor genes based on defective pupation. Genetics. 177, 1667-1677 (2007). Wu, M., Pastor-Pareja, J. C., Xu, T. Interaction between Ras(V12) and scribbled clones induces tumour growth and invasion. Nature. 463, 545-548 (2010).